President Donald Trump Thursday ordered new sanctions on individuals, companies and banks doing business with North Korea as he sought to further isolate Pyongyang and increase economic pressure on the regime to curb its weapons programs. He also said China’s central bank is ordering its financial institutions to stop dealing with Kim Jong-Un’s regime, a crucial step by North Korea’s largest trading partner. It isn’t clear what impact the heightened sanctions will have on North Korea, which has been economically isolated for years. But it suggests that Trump, who earlier this week threatened to “totally destroy” North Korea if it provokes the U.S. or allies, is continuing to pursue economic and diplomatic means to address Pyongyang’s nuclear and missile programs. Trump said the measures are intended to disrupt critical North Korean shipping and trade networks by targeting any entity that does business with the nation. Trump signed an executive order authorizing the U.S. Treasury Department to effectively cut off from the U.S. financial system any foreign individual or entity that does business with North Korea, including foreign banks. Vessels and aircraft that visit North Korea or that engage in a ship-to-ship transfer with another vessel that has visited North Korea would be banned from the U.S. for 180 days, according to a White House fact sheet. Treasury Secretary Steven Mnuchin said in a briefing that he informed People’s Bank of China, the nation’s central bank, of the new sanctions Thursday morning in advance of the announcement and said he had a “productive” discussion with officials at the bank. People’s Bank of China posted a notice earlier this month directing financial institutions to stop opening accounts for clients on UN sanctions lists and suspend financial trading and export-related credit services for those clients. Trump announced the U.S. sanctions order at the start of a luncheon meeting in New York with South Korean President Moon Jae-in and Japanese Prime Minister Shinzo Abe, key U.S. allies in the region. Mnuchin earlier this month warned the U.S. may impose additional sanctions on China to further squeeze Kim’s regime. The United Nations Security Council this month approved another round of sanctions that seek to cut North Korea’s imports of refined petroleum products to 2 million barrels a year, ban textile exports and strengthen inspections of ships that are believed to be carrying cargo in breach of sanctions. But to avert a threatened veto by China and Russia, the action stopped short of a U.S. demand for a total oil embargo and a freeze on Kim’s assets. “The United States has great strength and patience, but if it is forced to defend itself or its allies, we will have no choice but to totally destroy North Korea,” Trump said Tuesday. North Korea has been the most urgent issue before the UN following the Kim regime’s Sept. 3 test of what it claimed was a hydrogen bomb and its launching of two missiles over Japan in the past three weeks. 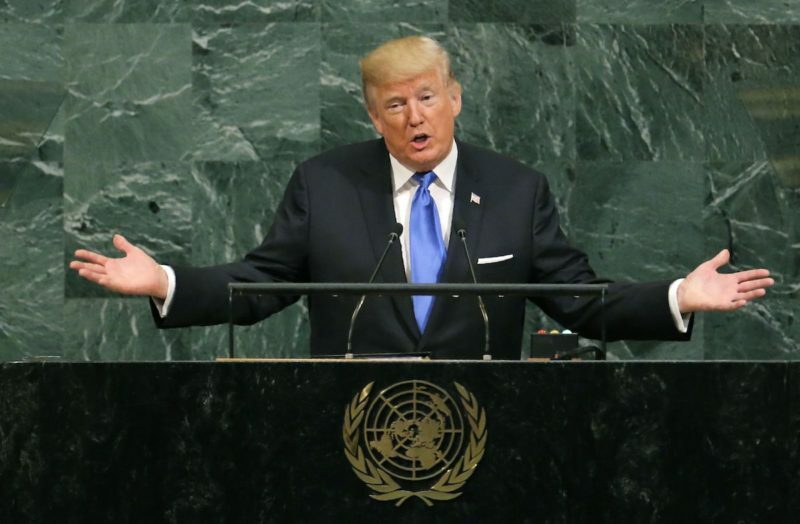 Trump won Russian and Chinese support for the most recent round of international sanctions on North Korea but indirectly criticized China in his UN address for continuing to trade with the isolated nation. Rescuing 162 migrants trying to reach Europe.